Before I begin, I wanted to let readers know I will be in NYC on November 10 and 11 for a series of meetings. If anyone would like to schedule a meeting or just grab coffee, let me know and I’ll see what I can do. I always enjoy meeting blog readers. They’re a sophisticated set. So, who’s interested in buying shares in a leveraged, capital intensive business operating in one of the world’s least attractive geographies and fraught with political risk? What if I also told you that this company’s revenues are down 25% year-over-year and that this weakness may continue for the foreseeable future? If you’re still reading, I suppose I should also tell you this company produces huge and sustainable cash flows, operates with barriers to entry, enjoys the backing of the world’s premier operator in its industry, and benefits from US dollar strength. This company is Global Ports Investments Plc. True to its name, the company owns and operates 10 different marine terminals, in whole or in part. Despite the ambitious moniker, the terminals are actually clustered in and around St. Petersburg, with two in Finland, one in Estonia, and the final terminal on Russia’s eastern coast. Global Ports Investments has existed in its current form since late 2013, when the company merged with rival NCC Group to form Eastern Europe’s largest container terminal operator. The resulting firm has 537.2 million shares outstanding, of which 20.5% are publicly floating. Global Ports Investments shares trade as Global Depositary Units on the London Stock Exchange, where one GDR equals three shares. The GDRs are denominated in US Dollars. 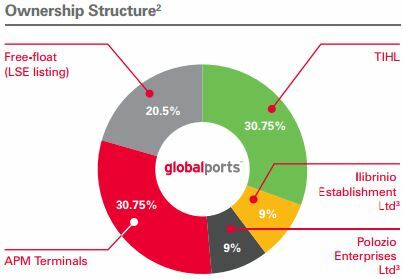 The remaining 79.5% of Global Ports’ shares are held by various large port and marine terminal operators. Major international terminal operator APM Terminals (part of the A.P. Moller-Maersk empire) owns 30.75%, and Russian transportation group TIHL owns another 30.75%. The remaining 18% is held by the former owners of NCC Group. St. Petersburg’s proximity to Moscow and Russia’s populated regions makes it the port of choice for Russian imports and exports to the West. In 2014, Global Ports had throughput of 2.7 million container equivalents. 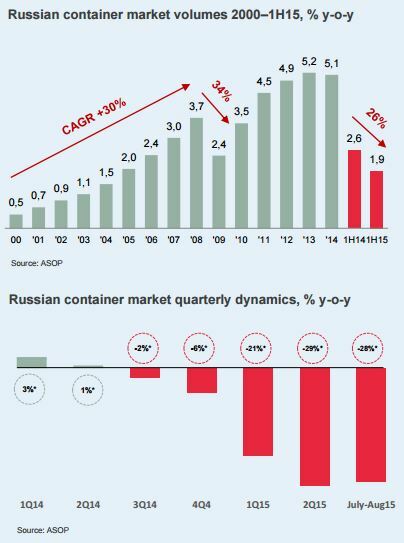 This represented 53% of Russia’s total 2014 container volume, which has grown rapidly over the last decade. Unfortunately, Russia’s current woes (slumping commodities prices, the plunging ruble, internationally condemned military actions, crippling social issues, and more!) have taken their toll and the nation’s import and export activity has plunged. Container market volumes are set to finish 2015 at 2008 levels, down 26% from 2014. Global Ports has not avoided the carnage. The company’s first half 2015 report showed consolidated revenues down 25%. Below is a look at Global Ports’ recent results as reported. I have adjusted EBIT and EBITDA for one-time figures like writedowns, but otherwise I am simply parroting the company’s earnings releases. The presence of minority interests complicates the financial reporting somewhat, but I’ll get to that in a bit. Results are in USD, Global Ports’ operating and reporting currency. At first glance, things look bleak. Revenues, EBITDA, EBIT, free cash flow, all down. But there’s something extraordinary here, the EBIT margin! In an environment of falling revenues and utilization, Global Ports managed to expand its operating margin by a full 1,240 basis points. That is an extraordinary achievement. The company credits the results to cost control. Indeed, Global Ports’ cash operating costs declined 37% from 2014. The cuts were achieved by heading headcount by 10%, idling 15% of equipment and looking for administrative cost savings. Impressive. Not many companies mount this kind of all-out assault on costs during difficult revenue environments. However, the company also had a very important tailwind: the crash of the ruble. Nearly half of Global Ports’ operating costs are staff-related, and the plunging Russian currency accomplished the company’s goals quite neatly, effectively reducing salaries for Russian employees by 40%. So that’s how Global Ports has been able to withstand a dramatic decline in revenues: an equally dramatic decline in operating costs. I do expect that trade volumes will recover eventually, and continue their growth path in the long run. I am confident that on the whole, world trade will continue to increase in the decades to come. I also expect the trend toward containerization to increase. It’s simply efficient. Nonetheless, I would not be surprised to see Russia’s shaky economic standing leave traffic at Global Ports’ facilities depressed for quite a while. Assuming no recovery in trade volumes, just what level of profitability and free cash flow can Global Ports sustain? Figuring that out requires a bit of digging. First, let’s take a look at exactly what Global Ports owns. Below is a listing of the company’s various terminals and their capacities, plus the company’s level of ownership in each. Global Ports’ share in its Russian terminal holdings equates to 94.3% of the total throughput capacity of these terminals. That’s great, because these operations account for the lion’s share of the company’s profits. The oil terminal, Vopak EOS, is the second largest source of profit. The Finnish ports are only marginally profitable, though they are growing quickly. Global Ports very helpfully provides a high level of disclosure for each of their operating segments. The graphic below shows 2014’s segment results and Global Ports’ ratable share of profits. 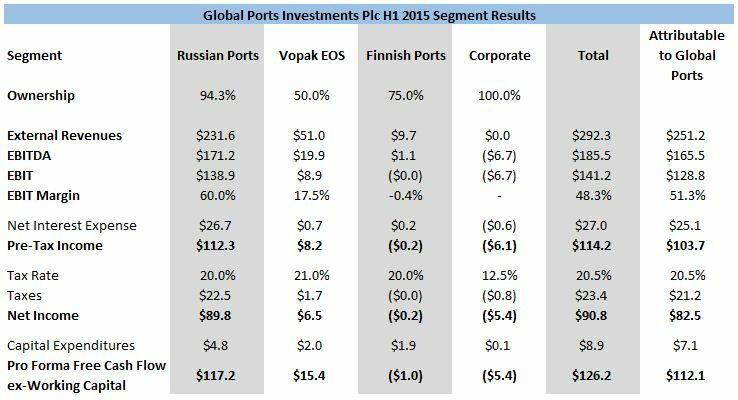 Though it’s impossible to tell exactly how profitable each particular Russian asset was, I’ll be using the 94.3% capacity ownership figure to estimate Global Ports’ share in profits. It’s the best I can do. Looks like in 2014, Global Ports’ share of its segments’ EBIT was about $281 million. That’s really not so far away from the reported figures after all, but it is a difference. Now I will perform the same exercise for the first half of 2015’s figures. I’ll go a step farther and provide some pro forma net income and free cash flow figures for each segment as well. Global Ports’ financial statements have some huge one-time currency-related items and tax effects, which I’ll ignore. Instead, I’ll use the statutory tax rate for each geography. Again, Global Ports is looking pretty good with $129 million in proportional EBIT in the first half of 2015, and $112 million in pro forma free cash flow. This is not a particularly seasonal business, so assuming no further deterioration in trade volumes, it seems likely that Global Ports will be able to post nearly $258 in annual proportional EBIT and $224 million in free cash flow in 2015. So what do you have to pay for that kind of EBIT and free cash flow? I could compare that free cash flow with the company’s market cap and show a yield figure (hint: it is high) but I always prefer to evaluate businesses on an enterprise value basis. In order to do that, one more step remains: figuring out the company’s ratable net debt. Fortunately, the company once again provides that level of disclosure. That wasn’t too tough. On a proportional basis, Global Ports is carrying a cool $1.11 billion of debt. That’s high, but not beyond reason for a capital intensive firm with a toll-taking business model and strong margins. In the depressed environment in which the company is operating, Global Ports has wisely decided to cease paying dividends and to devote excess cash to deleveraging. The company paid down $92 million in debt in the first half of 2015 alone. 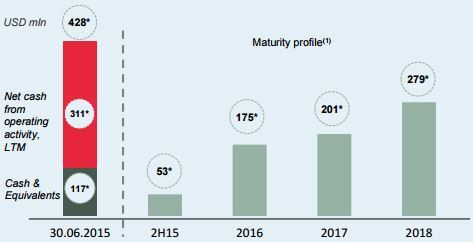 The upcoming debt maturity profile is prudently staggered, with annual principal payments through 2018 at below trailing operating cash flow. The average interest rate on the company’s debt is 6.0%. And most importantly, virtually all of the debt is USD-denominated. I can hardly stress enough how important this is. No matter how the Russian ruble may fluctuate, Global Ports debt service requirements will remain constant and matched by USD revenues. Now back, finally, to what we have to pay for all of this. At present, Global Ports’ market capitalization is $764 million. Add the $1.111 billion in proportional net debt and you get an enterprise value of $1.875 billion. Based on my 2015 projections, Global Ports shares trade at 7.3x current year EBIT, and a massive 29% free cash flow yield. On an unleveraged, fully-taxed basis, the free cash flow to the enterprise yield would be 14.1%. Those are rock-bottom figures for a business with this competitive position and free cash flow profile. Seems to me that the current valuation reflects excessive pessimism and a myopic focus on near-term results. But before anyone goes out and buys shares in the morning, please read on. There are also real risks to Global Ports Investments shares. First, there is no getting around the fact that this is a Russian business. Yes, its tax domicile is in Cyprus and it operates in USD, but substantially all the company’s major sources of income are quite literally on Russian soil. Investors in undemocratic societies with weak rule of law always run the risk that their company’s assets, or their own shares, will be “liberated” at a time and valuation not to their liking. After all, why should greedy, hegemonic Westerners profit from the labor of the Russian people? The Motherland, and all that business. It’s a real risk. I do think the involvement of a major European conglomerate (A.P. Moller-Maersk) reduces the risk of anything untoward going down, but at the end of the day, just under half of Global Ports’ shares are owned by Russian billionaires. These guys don’t exactly have a sterling reputation for treating minority interests with fairness. Second, investing in Global Ports is placing a bet on stabilization and recovery taking place in the Russian economy. Yes, I did say that I believe that global trade has nowhere to go but up in the long run, but that doesn’t mean investors won’t feel quite a lot of pain in the meantime. Every investment one makes comes at the cost of not buying something else, and those waiting for a Russian economic recovery may find themselves waiting for a long time. Nobody really knows when or if commodities prices will bounce back, or if Putin will see fit to end his warmongering and economic sanctions will be rolled back. Things could easily get much worse before they get better. Finally, I can see one more scenario in which Global Ports shareholders would lose out: one in which shipping volumes are stagnant or decline further, but the ruble climbs. This would reverse the cost-saving effects that Global Ports has enjoyed, and could put a serious crimp on operating margins. The ruble is actually down 13% since June 30, but it’s a volatile currency and it could easily soar. I don’t view this risk as all that likely since shipping volumes and a rising ruble are likely positively correlated, but it is real and difficult to hedge against. Of course, none of these potential pitfalls could come to fruition, and investors buying at this price could realize a very nice return as the company deleverages and its earnings recover. I view this as the slightly more likely scenario, but I am not quite confident enough in that assessment to take the bait. Still, Global Ports will be a fun one to watch for now. Alluvial Capital Management, LLC does not hold shares of Global Ports Investments, Plc for client accounts. Alluvial may buy or sell shares of Global Ports Investments, Plc at any time. I respect your research a lot, but this one is a stretch. Nevertheless, thank you for your analysis. I don’t know if you heard this on the news this week, but one of the Russian Ministries announced that if oil stays at its current level, Russian reserves will run out next year. This can’t be good for trade with Russia, but on the other hand it should be a negative for the ruble. So the EBIT margin could shrink, not withstanding the company’s efforts to cut costs. This one will certainly require a lot more thought. Thanks for the comment, as always. It’s true; Russia’s economy is a mess and things don’t look to be improving any time soon. That’s what makes this stock both very risky and very potentially lucrative at the same time. I think the business is fairly strong with a great competitive position, and I’m not too worried about financing over the next few years. Maersk is large enough to backstop the entire debt structure if it came to that. But yes, continued economic catastrophe in Russia would hurt Global Ports. Have you peeked at Ocean Wilsons Holding? Similar activities, similar head winds. Probably better positioned and more room for growth? Reports in dollars, Bermuda based, activities in Brazil, has an Investing Portfolio managed by Hansa Trust. Negative: why are they not aggressively buying back stock? Yes. I actually wrote them up a while back. They are cheap and long-term holders will do quite well. For now though, anything tied to Brazil is going to struggle. It’s just one bad headline after another there. I think a low earnings multiple (by western standards) is probably motivated since the company mainly operates in Russia. Russia inflation level is about 15% so a high discount rate seems warranted. The company definitely gets a Russian discount. That discount is justified to an extent, but I am not sure that this company needs to trade at a 30% FCF yield. I was wondering if you’ve ever looked at Parkit Enterprises Inc. I don’t know how to analyze real estate, reits, and companies that have joint ventures on them so I was hoping maybe you can write about this one one day. Thank you for an interesting idea & great blog! They get about $200 revenue per TEU, with costs of under $100 per TEU. This has been pretty stable over previous years. When I look at other terminal companies, for example APM terminals and Hamburger Hafen, they only get about $100 of revenue per TEU. Global Ports’ Finnish ports also get about $100 per TEU. Asian operators, like China Merchants Holdings and Cosco Pacific get only $30 (seems unbelievable in comparison). So the extraordinary profitability seems to be due to higher charges per container. This is of course great and understandable due to their excellent competitive position. Still, I’m a bit worried that there could be downward pressure on the prices in the future. That being said, this is a very compelling idea, and I’m going to do some more work on it. I think the crux of the thesis, beside of country risk, is the pricing power of the company going forward. A new port – the port of Bronka – has just opened near Saint Petersburg. Check it out, it has huge capacity. Reportedly cost just $400m for 1,45m TEU capacity. That’s roughly 1/3 of what GLPR has, so are we looking at a $1,2B replacement value vs $1,9B enterprise value? What’s going to happen to GLPR $200+ revenue / TEU in this down market? No wonder the company is looking to save cash and reduce debt. I’m going to pass on this investment.